Now I have ALWAYS been told that after a poor period of government such as New Zealand endured in under Helen Clark and the Labour Parties regime that the incoming party will clean up (which they did, though nothing like Queensland), do poorly at the next election and barely scrape together a coalition (yep well one extra seat!) and then, if they get that far, bomb at the third election. Well John Key’s National-led Government look like they are the anti-norm, the way things are going they could even once again increase their seat ratings. Now I extremely doubt this far out they will actually get 60+ seats next election, but heck unless they get a real opposition in the next twelve months it is hardly mission impossible. The lastest Roy Morgan poll puts National on 60 seats with a 47.5% vote share, easily able to form a centre right government, assuming they go back in with UF and the Maori Party then able to form a very safe coalition. In my humble opinion, and I have commented on this previously, John Key runs a friendly and tight ship. Captain Key is the leader of a luxury cruise liner while Shearer is on the Titanic with his crew kicking the passengers into the icy and lonely waters! Poor Shearer, with colleagues like his you don’t need an opposition! I am not denying for a second that it is an extremely long political stretch till the next election, but seriously Teflon John (as the left wing bloggers like to call him) has delicately worked through several crises effectively. Until a strong opposition comes along he is hanging out on easy street with a strong team to back him up. Even with the aggressive mainstream Left wing media backing him up (so so poorly) David Shearer is proving to be very ineffective. 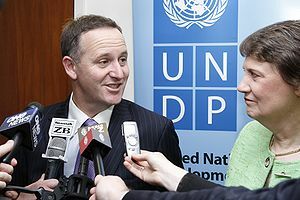 This entry was posted in New Zealand, Politics and tagged Helen Clark, John Key, Labour, New Zealand, New Zealand National Party, Roy Morgan Research, Titanic. Bookmark the permalink.